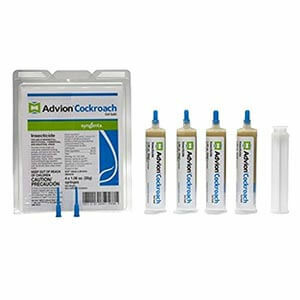 Advion cockroach gel bait is one of the best ways to get rid of cockroaches in your home. However, some people still claim that it doesn’t work. Are they right? Does this bait not work as well as everyone claims–including me? Read on because I’m going to give you a thorough review of this bait and explain why it didn’t work for some, but has worked so well for me and many others. What is Advion Cockroach Gel Bait? Plain and simple, it’s a cockroach bait. The bait is a gel. You can buy it here, and they come in small tubes of the gel or small bait stations with the gel in it. The active ingredient is Indoxacarb (about 0.5%). The gel also contains a bait that makes it irresistible to almost all known cockroach pests. If you’ve been searching around for solutions to your roach problem, then I’m sure you’ve seen Advion mentioned one too many times. Before that, you’ve probably never even heard of it or seen it at the store. You might be asking yourself why you’ve never heard or seen this product before it works so well. The answer is straightforward. It’s a professional bait. That means it’s a product intended to be used by trained professional exterminators. Because of that, it is explicitly marketed to professionals. It gets results, and it “keeping it a secret” helps them stay in business. I mean why you would hire an exterminator if you knew their secrets? Also, Advion wasn’t always as readily available to the home user until eCommerce took off. It’s now much easier to get your hands on professional strength roach killers—and not have to hire an exterminator—thanks to the internet. The truth is, this bait will work for most species of cockroaches. But it was made to specifically kill the following species, which are known to be significant pests for us humans. Like I said, this product was initially used by trained professionals. Which means for the average home user without training and expereience, there are many things you can do very wrong that will reduce the potency of the product; leading to some of those complaints about how it doesn’t work. We’ll get more into details about those big no no’s further down. You can use it to control and eliminate roaches by applying it both indoors and outdoors. If used outdoors, the gel will dry out or go bad sooner because of exposure to the elements. The active ingredient, Indoxacarb, does not kill right away. Instead, there is a short delay before the poison will kill an affected cockroach. For those who don’t know the truth, that may sound like a bad thing. However, it’s the opposite. The delayed death is what makes this bait so powerful and efficient. After eating the poison, the contaminated cockroach can return to the nest to contaminate (poison) the others hiding in there. The affected cockroach will poison the others through its feces, physical contact, and ultimately, cannibalism. Yes, you read that right. 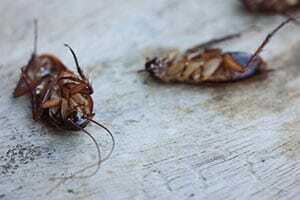 Roaches are known to eat the dead carcasses of their fellow cockroach. This poison bait turns a cockroach into a ticking time bomb that will kill the others safely hiding from you. A single affected cockroach can kill up to 40 more by itself; the bait gets the attention of more than just one. Yes, it’s easy to use roach baits, but it’s also easy to use it the wrong way. Many users who didn’t get excellent results with Advion make the mistake of not applying it correctly. They either use too much, or they use way too little. You have to use the right amount if you want the best results. Don’t forget to check out the mistakes you can also make using boric acid. The first thing you should do is read the provided instructions that come with the product, as well as the labels on it. Apply a dot of the gel bait about the size of a pea. Apply the bait every 2 feet. For example, for a wall that’s 10 feet long, you would place five dots total, and you would spread them about two feet apart. If you read the instructions, you’ll realize the guidelines above are for “heavy” infestations only. Light to moderate infestations just needs 1- 3 dots per 10 linear feet. I say the best way to get rid of them as soon as possible is to hit them hard and fast. Using less aggressive applications might give them a chance to learn to avoid the bait. Don’t give them this opportunity at all. Besides, it’s not very often you only have a light infestation. If you’re here, then you probably have a big problem. While it works so much better, Advion gel bait does cost more than some of the other brands that are more familiar to you. That’s why it’s important to know how much you need–so you can save some money. Decide which rooms you’ll be treating. Measure the length of the areas you will be treating for each room. Add up the lengths for the total sum of your measurements. Divide the total by 2 (one dot of gel per 2 feet). The number you get is the number of applications you will need. Refer to the list right below to determine how many tubes you will need. You can buy Advion gel in individual tubes, and you can also find them in a box of 4 tubes. Each tube contains 30 grams of the gel. Before you run off to buy, remember that you should always have more than what you think you need. You can’t buy this stuff at local stores. You have to order it through the internet so it can take several days or longer to arrive. You don’t want to run out and give those roaches almost a week to recover and adapt.I also recommend you continue to apply the bait for another month after everything seems clear. Why? To help ensure your victory In case a few of them had managed to survive. Another major mistake someone people make is they don’t use the bait in the right places. Blindly applying the bait will only waste money and give them less susceptible to the bait. So take note of the locations below because that’s where you should be applying the bait. Major and small appliances. Apply near the legs or the bottom of the appliances. Inside the cabinet doors towards the bottom and the top. Apply to the inside corners and the bottom of wall cabinets where it meets the wall. Trash cans. Near the bottom. By the door and in the corners. Along baseboards, where the wall meets the floor. Anywhere else where you see a lot of roaches. Cracks and gaps in the house that will allow them to enter. Doors. Apply near the bottom. Other potential entrance points missing from this list. Make an effort to close off possible entry point. After you close the entry points, continue to add roach bait for a few more weeks. Let’s start off with how long it takes to attract roaches. Assuming that you’ve never used this product before, it starts getting their attention right away. The scent they use for this is quite powerful; combine it with the cockroach’s extraordinary sense of smell and it gets noticed within minutes. Just don’t stand there hoping to see it work because they won’t come out while you’re there. How about after they’ve eaten the bait? How long does it take to kill them? Most of them will die within the same day of consuming the bait. You won’t see any noticeable difference for about a week to two weeks. Remember, bait doesn’t kill them right away like DemonWP and other fast-acting sprayed on contact killers, so give it a little time. If you’ve done everything right (just read this article) then they should be gone in a few months. Now, if you took some shortcuts then it could take longer, or you might not be able to successfully eliminate them. But if you read this entire page and follow all the info that’s here, they don’t stand a chance. An unopened tube of the bait will store for up to two years. That is assuming it is stored at room temperature and isn’t open. A tube that has been opened, but adequately closed, will save for about one year. Using bait that is long past the recommended shelf life is fine, but it won’t well. The bait won’t attract as many roaches. The active ingredient, Indoxacarb, will be less potent. Allowing the insects to feed on a very weak poison can give them to the chance to develop a high resistance; making it much harder to get rid of them entirely. We’ve discussed a few things here and there about the dos and don’ts of using this roach bait, but there’s still a few left that is important. Pay careful attention to these, because they will significantly affect the results you get from using this product. Don’t use fast acting contact killing pesticides with roach baits. Do note the location of where it’s being sprayed though. That’s one area you’ll want to apply the bait. We’ll start off with the one thing you don’t want to. Don’t use roach baits with the pesticides that you apply by spraying. These are contact killers because when cockroaches make contact with the pesticide, it quickly attacks their nervous system and kills them within minutes. Examples of contact killer include DemonWP and others. If you are experienced and know what you’re doing, you can bend this rule. However, for the average home user, it’s best to follow this simple rule. Is there a reason why this is a big no-no? Yes, there is a good reason. Remember what makes Advion so efficient? Yep, it’s the domino killing effect. What does a contact killer do? It kills the affected cockroach within just minutes and sometimes as fast as just seconds. Because contact killers kill so quickly, they negate the domino effect that makes Advion so efficient. In other words, it’s the same as not using roach baits at all. So don’t use contact killing pesticides with roach baits. With that out of the way, let’s talk about the things you should do when you’re using Advion. The first thing you’ll want to use roach baits with is boric acid powder. Boric acid has the same domino killing effect so using the two of them together will increase your success rate. Remember to use a bulb duster to get the right amount of powder every time. Keep in mind that Avion comes in tubes. Sure, it comes with a plunger, but that can get tiresome if you apply a lot of bait. Fortunately, there is a bait gun designed specifically for using tubes of roach baits. Of course, this is more of a convenience, so skipping this one is perfectly fine. But for the small price, it’s worthwhile if you’re dealing with a massive infestation and a big house/building. Insect growth regulators (IGR) will help you get rid of those roaches a lot faster. While IGRs can’t kill cockroaches and it can be pointless by itself, it becomes key to a faster and more assured victory when you use it with roach baits. IGRs are exactly as their name implies—they stop roaches from growing into adults. If they can’t become adults, they can’t reproduce and create more cockroaches. Growth regulators will also prevent eggs from hatching. One egg can turn into over 40-50 cockroaches, so making sure the eggs don’t hatch makes a big difference. Once applied, the bait will harden within a couple of days. There’s no need to be worried though because it’ll still work great. After a month though, it won’t work so well, and you should replace it with fresh baits. One month is just a general rule of thumb. You should monitor the bait and how well it’s working on the roaches. If the bugs aren’t dying, or their numbers have stopped decreasing, then you’ll want to try changing the baits right away. Baits applied to the outside are subjected to harsher conditions so they’ll deteriorate much faster. That means you need to check on them more often. Here are some more tips to help you get the most out of this product. It works well if you do things right and it can work even better with the following tips. Increase the chances they’ll eat the bait by removing food sources. If they’ve got nothing else to eat, you won’t have a choice but to eat the baits. It’s not possible to remove all food sources, but you should eliminate as many as you can. For kitchen counters, use bottle caps to hold the bait. Place the bottle caps out during the night and store them safely away during the day. Use wax paper to apply the baits under furniture and large appliances. Just put the bait on the paper, and slide it underneath. Skip the oven because of fire hazards. For vertical applications (walls, baseboards, the sides of appliances, etc.) use masking tape. Put the masking tape on first and then apply the bait. When it’s time to change the bait, just peel it away and repeat with new tape and fresh bait. Keep the bait Remember, this is food for them, so keeping it fresh means they’ll be more likely to eat it. The scent will also be much stronger and attract more roaches. There are many questions, and answering them all on this page won’t be possible. However, I’ll explain some of the most commonly asked questions. If you didn’t get the answer you were looking for, please feel free to leave a comment below. According to the manufacturer, it is pet safe if used as directed. The amount of the active ingredient used in Advion roach bait gel is small enough that it shouldn’t cause any harm. However, my personal opinion is to be better safe than sorry. I would recommend you try to keep the bait out of reach from your pets. Is It Safe to Use Around Food? The answer to this question is similar to the answer to the pet question above. The amount of active ingredient shouldn’t cause harm and should be safe to use in the kitchen (as well as restaurants). Avoiding direct contact with food is still recommended. You should also be able to use Advion in cabinets where boxes and cans are. Any other food items such as flour, sugar, etc. that are opened should be in a closed container or large Ziploc bags. It’s Not Working, What Am I Doing Wrong? Are you sure it’s not working? Or are you assuming it’s not working? If you think that it’s not working because you do not see dead roaches everywhere, then that’s not a proper way to assess if the bait is working or not. Assuming that you have given it the right amount of time to work (at least a week or two to start seeing some results), you need to look at how often you are seeing roaches and how many you are seeing. Leave the lights off and stay away from the kitchen for a few hours. Quickly turn the light back on and see if you see fewer roaches run for cover. If you were seeing roaches during the day before, how often do you see them during the day now? If you don’t’ seem them as often now, then it’s working just fine. In this Advion cockroach gel bait review, we have covered some of the questions that are commonly asked. For more information, be sure to check the manufacturer’s website here. We’ve also talked about how to use it efficiently and some of the mistakes to avoid. Hopefully, you know why or at least, kind of understand why this brand of roach bait is recommended so much—because it works well. Just remember to give the bait time to work. 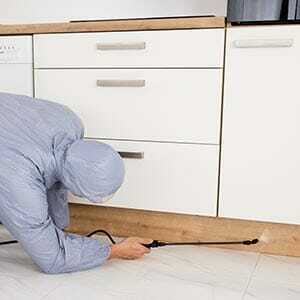 Remember that it can take up to several months to eliminate an infestation. If you have any further questions that have not been answered, please feel free to leave a comment below. Or if I missed a really important bit of information, please consider sharing it with us below. I have a huge infestation of cockroaches one night I came home from work and when I turned on the kitchen light there were hundreds of all sizes crawling all over the place it was like something out of Alfred Hitchcock. After the paramedics got here to do CPR I was just fine 😉 so according to this I have not used it correctly and I have one tube left and I’m ordering for more I just lined the baseboards of the entire kitchen with it plus under the appliances I’ve had no issues with under my stove but it is electric. I have boric acid up in the cupboards and between all of this I am using Hot Shot Vapor Foggers and they seem to really help and then after I are out like I’m going to come in again and lay down some new gel baits. This is a double wide mobile home that has been divided into four separate living units they have one specific tiny unit that apparently has been infested repeatedly I don’t know where they’re coming from but there’s lattice all the way around the trailer and I’m going to peel some back and see if I can stick a couple of these gels to the bottom of the trailer up underneath the stairs everything was fine until last night it was the weirdest thing I saw this medium size too small size 1 moving kind of slowly across the kitchen floor after almost 3 weeks and then when I lay down in the bed and was playing with my dog something caught my eye there’s a big one running along the baseboards of the bedroom so I’ve managed to get over there and smack it dead but it has prompted me to do another bombing and it’s not even been a month and redo the bait gel I think that once I redo the bait gels I might see some more progress this problem is also compounded by the fact that the kitchen definitely has mold that has traveled from one small spot by the frigerator around the back of the refrigerator and it’s coming across the baseboards in the kitchen and I also have mold in my bathroom not too happy but after all this is Key West and since Irma there is no other place to live that is Affordable $1,800 a month for a studio is not affordable and I have a little dog so that’s my story I can keep you posted because my dog is wheezing I have been wheezing I’ve been very sick since I’ve lived here I know now why between the mold and the roaches I have ordered an air purifier a very expensive one so we’ll see what happens but I think the advion bait gel does work and work pretty good but I did use it all over and not in just spot I like the suggestion to put it on and a cap or something for the kitchen counters awesome suggestion and I did drop a couple drips inside the cabinets along with the boric acid. It’s a long story but it’s all true so at the end of the day I say the stuff works I didn’t even use it right and it looks like it’s been working but this is going to be a real tough infestation it is summer in Florida and it seems like everytime it rains the mold getsworse and the roaches come back. Whoever has a roach infestation needs to pay attention to this column because what I learned was amazing thanks thank you so much! I have apparently a light infestation. I used to have lots of roaches; then I had bedbugs and an exterminator. After his treatment not only were the bugs gone but so were the roaches….for a year. OK, so I got the Advion. Seemed to work well. After a week I garbaged the old dots and wanted to put down new ones. But when I pushed the plunger of the tube it wouldn’t budge. I eventually really banged it hard against the kitchen counter. After a longtime suddenly there was a burst: some dried stuff came out and then a big string of the paste. OK, so I would replace the dots every 2-3 days. Today was day 3 but again the plunger wouldn’t plunge. So I placed the tube into cold water. After an hour, still nothing. Now what? I just started using this. I used a ling in the cracks of the floor and between the counter tops to put the stuff in. Besides putting a drop I made a line across. Will it still work the same. the amount doesn’t matter if you distribute it well in all areas, roaches don’t eat loads of foods, if put too much it will kill the roach too, if its real poison it qwill kill the roach no matter what. The Advion gel IS working for us. We just moved into a nice house in the suburbs of Athens, Georgia. However, in the first few weeks here we have seen a few (less than 10) cockroaches of both the smaller and the bigger “palmetto bug” sizes inside the house and on the deck. We think we probably have just a “light” infestation. We bought this bait and applied it as directed inside and outside. We have a baby and a dog so I was careful to put it only in places that neither of them could access. I put it along the top of window and door frames in every room and inside the cabinet under every sink. I squirted some into the holes where the water pipes go into the wall under each sink. I put it on wax paper under the refrigerator, on shelves, and on top of the kitchen cabinets. If you have vinyl siding (we do) there are lots of good places to put it outside around the doors and windows. In the garage I squirted it into many places in the crevice between the concrete floor and the walls. Within 2 hours after applying I found a large cockroach struggling (dying) in the garage. That evening I looked around outside and saw one eating bait I put in the siding. After two days, I have found a total of 6 of the large cockroaches dying or dead in the house and garage. We have not found any of the smaller cockroaches dead, yet, but this is probably because the big ones are easier to spot. I can definitely recommend Advion gel bait. It was easy to apply and it is working. Buy it, Use it as directed. It is working for us. I would say mine is a hell of an infestation. Tons, and tons. Anyway, I applied Advion last night before bed throughout my home, and today…Whoa. So many dead roaches! I’m finding them EVERYWHERE. They’re on the floor, on the counters, on the tables and ALL dead or in the process of dying. I couldn’t be happier with this gel bait so far. They instantly went to the bait within minutes of having it out. The smell had drawn them in like a shark to chum. Highly recommend. Awesome product.